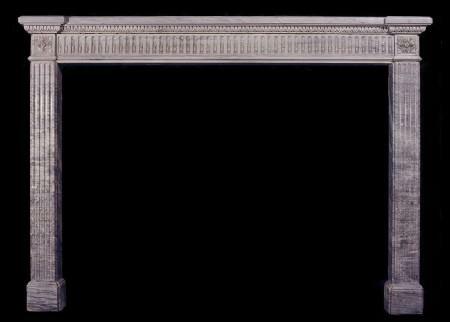 An 18th century (circa 1770) French Louis XVI Brocatelle marble fireplace, with panelled frieze with circle to centre, fluted jambs surmounted by square panelled side blockings. 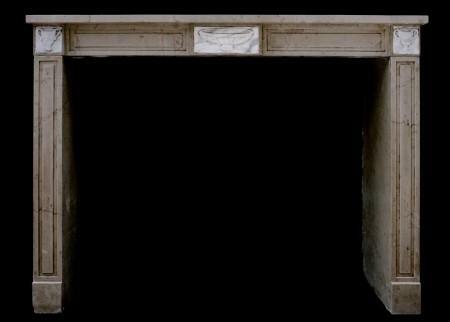 The frieze and shelf from one solid section of marble. 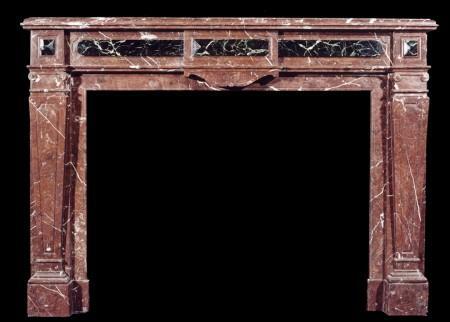 A late 19th century French Arts and Crafts fireplace in Belgian Fossil marble, with etched detailing of Greek Key and foliage to frieze. The jambs with etched bellflower drops, surmounted by scrolled side blockings. A Sarrancolin French Louis XVI style marble fireplace, with finely carved Statuary marble inlaid panels of, classical scene of reclining female to centre, foliage and ribbons to side panels and jambs surrounded by leaf moudling, the end blocking of leaves, ribbons and strung pearls. 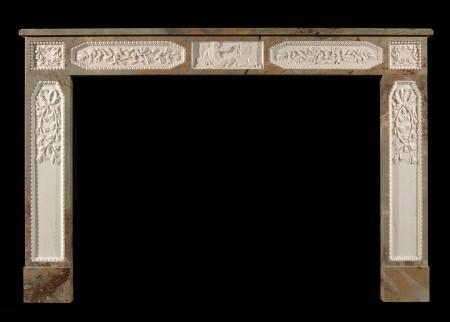 An early 19th century French Empire limestone fireplace, the panelled frieze with carved centre motif of Napoleonic bee and flowers, the panelled jambs with hexagonal motif to centre, surmounted by honeycombe design side blockings. The frieze and shelf in one piece. 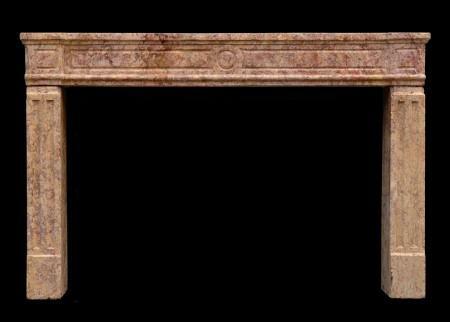 19th century French Louis XVI style Spanish Brocatelle marble fireplace, with plain moulded panelled frieze and side blockings, fluted jambs. Breakfront moulded shelf. 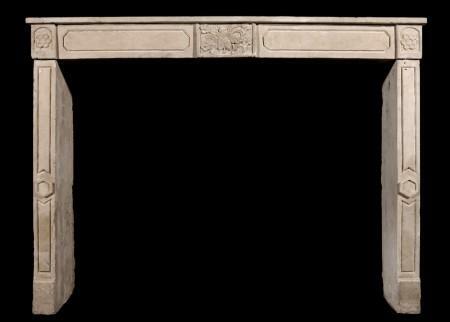 An 18th century French Louis XVI Dove Grey marble fireplace, with carved husks to flutes, fluted jambs surmounted by pateras, and carved egg and dart moulding under shelf. 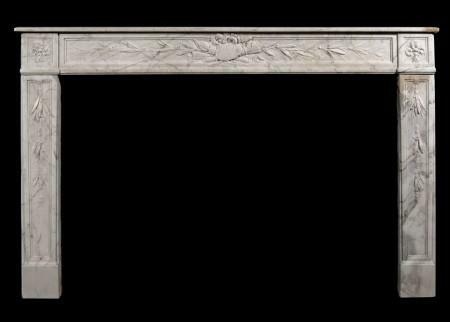 An 18th century (circa 1770) French Louis XVI veined white marble fireplace, with quiver and leaf frieze, carved leaf drops to jambs, surmounted by pateras. 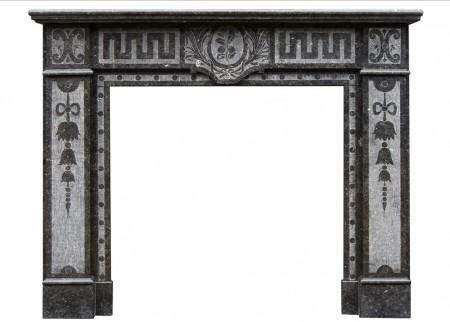 A French Louis XVI style Bourgogne stone fireplace with white marble carved centre and side blockings. A very important 19th century (Circa 1820) French Empire Sienna marble fireplace with elaborate ormolu enrichments to frieze and jambs. The fluted columns are surmounted by ormolu Corinthian capitals supporting shelf with egg and dart detail. In the opening there are the original cast iron interiors with the Napoleonic emblem of bees with which the Emperor is traditionally associated. Originally from the French embassy in Buenos Aires, Argentina. 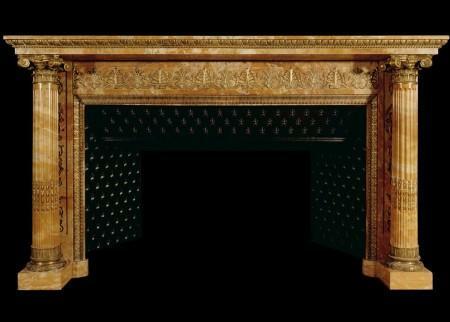 A 19th century French Louis XVI Rouge Royale and inlaid dark green marble fireplace, with panelled tapering jambs, surmounted by scroll capitals and moulded rectangular shelf. 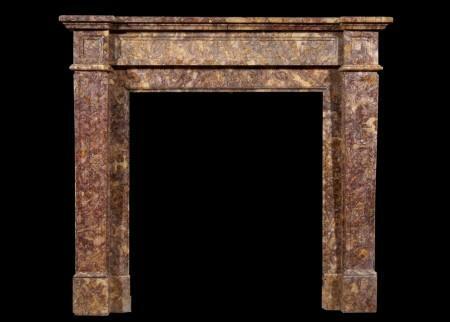 An 18th century French Louis XVI stone fireplace with sunburst centre blocking, and shaped fluted jambs. 19th century French Louis Philippe Breche Nouvelle marble fireplace with moulded frieze, shaped jambs and arched opening.